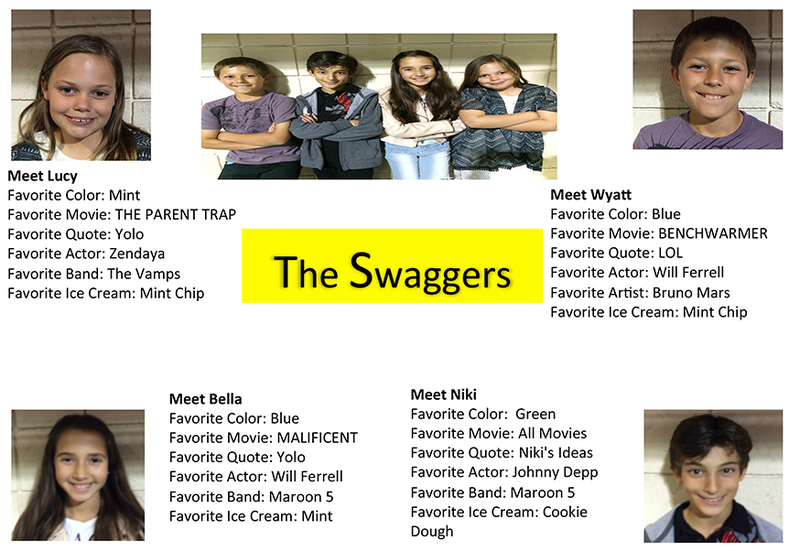 How did you come up with the name, "The Swaggers"? Bella: I didn't really pick it. They had it before I came into the band. Niki: We just started thinking of random names, and then we gave our favorites to the rest of the band members and they voted on it. Lucy: We wanted maybe "Cat Tails", "Worth IT", we changed the names at the beginning, but then "The Swaggers". How did you get involved with Lucy's $10 or 10 First Annual Kids Charity Concert, and why is it important to give back to the community? Lucy: I created it. I wanted to find a way to combine my three biggest passions of baking, music, and giving back to charity. This is what I came up with. It's important to give back because you can help make a person's or animal's life better. Wyatt: There are flyers and a web-site to promote the concert, bring 10 dollars or 10 items to donate to the charities. If you were able to go to one concert and take all of your friends, who would you want to go see and why? Lucy: The Vamps, I would bring the whole band and my BFFs Emily, Abby, Klara, and Julia. Niki: I would go to any concert. It would just be fun to have my friends there. Where are you from and how long has the band been together? Niki: We are from America. We practice in Woodland Hills. The Whole Band: About a year. Have you performed in front of a crowd before or will this be the first live performance? If yes, where? Whole Band: This will be our FIRST live performance. Besides performing at Lucy's $10 or 10 First Annual Kids Charity Concert, do you have any upcoming gigs? The Whole Band: Not yet. Wyatt: My sister, Lucy, is singing the National Anthem on my opening day ceremony at Westhills Baseball. How do you get inspiration to create your songs? What is the process? Lucy: It's hard, especially when you don't know the instrument and you are writing for it. I created one song in the shower! I write words first and then the melody. What genre of music do you perform? What is the first song you recorded? Lucy & Wyatt: At our house and Guitar Center. Lucy: I think The Vamps, because they give me a tune in my head. If you just won a Grammy, who are teh first two people you would thank? Bella: My family and band. Lucy: My mom and my band and Guitar Center. Wyatt: My mom and dad.